There was a great riot at Isolo, Lagos when a bus conductor stabbed a passenger to death over N100. Report has it that immediately after the scene, passers-by who were deeply bittered about the conductor's actions set him ablaze at the Spot. This has ignited panic in the area. It was gathered that the bus conductor picked up a knife from the wares of a roadside trader to stab the passenger over N100 balance on his transport fare. 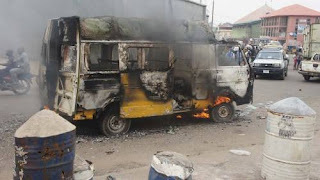 Irked by the death of the passenger, the passers-by were forced to set the bus conductor ablaze. However, the Bus driver fled after the scene.